The American Childhood Cancer Organization (ACCO) is excited to share our latest partnership with five Colorado Rock Bottom Restaurants through The CraftWorks Foundation. CraftWorks Restaurants and Breweries, Inc. is the parent company of Rock Bottom Restaurant & Brewery and is the company’s “charitable arm”. 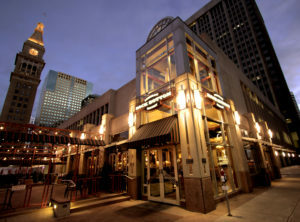 The first event, “Rock Bottom Restaurants Go Gold® for The Holidays” commencing this partnership, was spearheaded by Rock Bottom’s iconic downtown Denver store and will be held at five locations, four in the Denver area and one in Colorado Springs. During this event, Rock Bottom encourages local families to come together this holiday season to support kids fighting cancer through the ACCO. 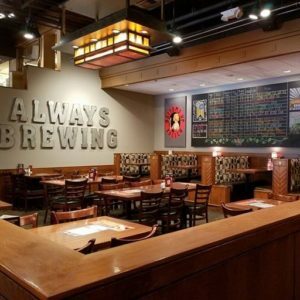 This fundraiser will center-around the “Wicked Elf Ale” special holiday tapping that occurs on November 15th and 16th, 2016, depending on the restaurant location. The tapping for the downtown store occurs on the evening of November 16, 2016 and all Rock Bottom employees will be wearing their pajamas. This Corporate PJammin Event will kick off the nearly six week fundraiser that will occur until December 31, 2016. Rock Bottom’s A.G.M., Kelley Cochran, was inspired to support this cause when she volunteered to attend the ACCO’s first large Corporate Event in Chicago IL. Jel Sert, the makers of the famous Otter-Pops/Fla-Vor-Ice treats hosted their own corporate PJammin Event. Over 200 employees wore their pajamas and included several local families that have been affected by childhood cancer. Click here to watch the video of the Jel Sert Corporate Event. ACCO’s corporate PJammin Events honor children fighting cancer with employees wearing their pajamas for the day. Children fighting cancer often wear their pajamas for long periods of time while on treatment. This event let’s families know they are not alone in their battle! In addition, the entire downtown Rock Bottom restaurant will also be decorated in gold until the end of the year. Gold is the color that represents childhood cancer. Proceeds from purchases at the five locations will go to ACCO and gold ribbon donation vouchers will be hung in the restaurant along with special Cozy Cat coloring pages for the kids, all to support our youngest cancer warriors. Rock Bottom and its dedicated team are eager to begin supporting local families currently going through childhood cancer treatment and are working with the local hospitals. The staff is also interested in providing necessities and toys for these families either directly or through the local Children’s Hospitals. Go Gold® is a registered trademark of the American Childhood Cancer Organization. ACCO would like to say “thank you” to our newest partner! Rock Bottom and ACCO’s local Founding Hope Fund, Hope 4 Heroes, have joined together to help five local families facing childhood cancer this holiday season with Former Football Player and Ring of Famer, Rod Smith! Click Here to learn more about the event that took place December 7th, 2016! Then, for the first event, Wednesday night, November 16th, ACCO was invited to kick off Downtown Denver Rock Bottom’s Go Gold® initiative! The entire restaurant staff was either in their pajamas or wore an ACCO Awareness Shirt. 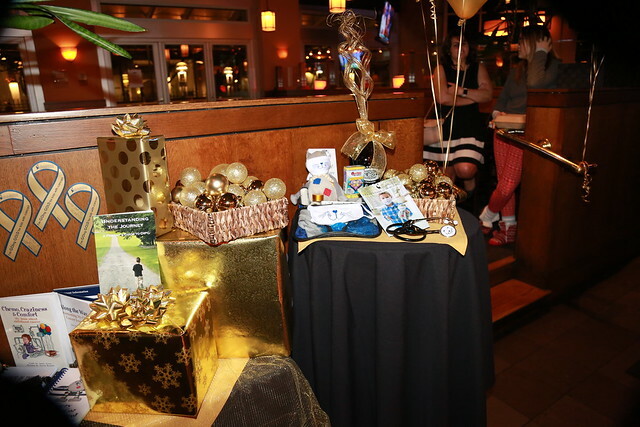 They decorated the restaurant in gold and invited guests to learn more about ACCO, our mission and how they can help families facing a childhood cancer diagnosis. Five Colorado Rock Bottom Restaurants are supporting kids with cancer this holiday season. Started by the Downtown Denver Rock Bottom and followed by four other restaurants, From November 16th through December 31st, a portion of the proceeds from purchases will go to the ACCO. In addition, guests can donate and a Gold Ribbon Voucher or Cozy Cat coloring page with their name will be hung in the restaurants, several local families that are going through childhood cancer are going to be sponsored by each restaurant for the holidays and guests will be able to “round up” tabs to help. If you live in the Denver or Colorado Springs area, please stop by your favorite Rock Bottom restaurant and help ACCO provide much needed support to children and teens that are fighting or have fought childhood cancer!